With two babies at home, we go through an ENORMOUS amount of formula. Thus, we have a plethora of formula cans that I’ve saved, not wanting to throw them out, knowing I would want to do something (or more than one thing) with them. The first thing I decided to do was use them to add a little more space to my craft closet. I am lucky enough to have a large walk-in closet with storage drawers that houses all of my craft & sewing supplies. It’s amazing, however, how fast I have filled up that space! In making these cans for some of my supplies, I emptied out a couple of drawers to make room for other things. Yay! They are cute, and organizational…how can you beat that? You could really use these for just about anything…art supplies (next on the list), laundry items (clothespins, etc. ), pantry storage, or even in the bedroom (lotions, hair supplies) or bathroom. empty formula can, label removed (you don’t have to use a formula can. I’m also saving oatmeal canisters…but you could use any type of round or square container that’s big enough for your needs. 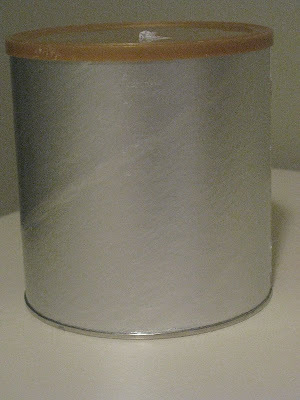 Cover your can with twine, using thin streams of hot glue to hold it in place. I only used hot glue every once in awhile, making sure to secure the beginning and end really well. I didn’t want to glob it down with too much glue. Pull the twine tightly, and wrap it well, and it will stay in place. Using the glue gun, adhere ribbon to the top and bottom rims of the can. 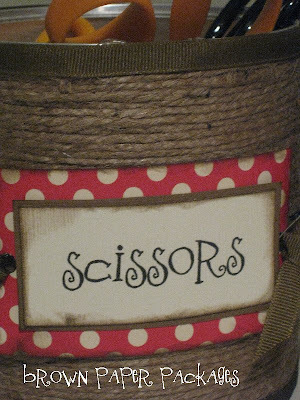 Create your label, and mat on card stock and scrapbook paper. I printed mine on the computer, but you could use vinyl lettering, foam stamps, or other method of lettering. Distress all edges. Punch holes in the sides of your label, and tie ribbon in a knot through the hole. 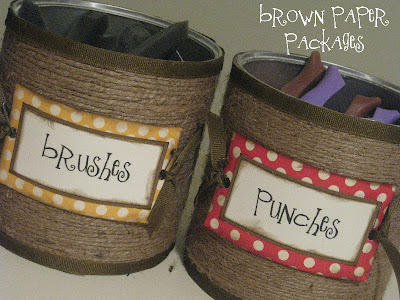 Attach the label to the twine, using the small safety pins. Ta-da! Now I’m off to my bed…to put my feet up, read the book I’ve been dying to dive into, and eat a candy cane (maybe a little hot chocolate too.) Bliss. I would love to know what font you use for your labels. I just love it! K. So, I have been following your blog for a while now… and I have decided to come out of hiding! ;) I LOVE YOUR BLOG!! You seriously have the cutest ideas ever! Thanks for sharing your talent with us. I have "tried" to re-create some of the things that you have made. Mine never turn out as cute as yours though! :) Thanks again and keep on crafting!! Very cute and useful. Everyone needs extra storage–these would come in handy. Steph–the font is called Freeze! You can download it for free here: http://www.kevinandamanda/fonts/freescrapbookfonts. She has a ton of fonts on her site, all free! Marni–I'm so glad you came out of hiding!! I'm glad to see you here. Twine is now officially on my to-buy list. These are so so so cute! These are so cute! I am featuring them at somedaycrafts.blogspot.com. Grab my "featured" button. These are very cute! The little label adds so much to them. Thanks for sharing. I've posted a link. Those are so stinkin' cute!! I'm having a twine themed link party at my blog (http://thesimpler-life.blogspot.com) and I'd love for you to link them up! 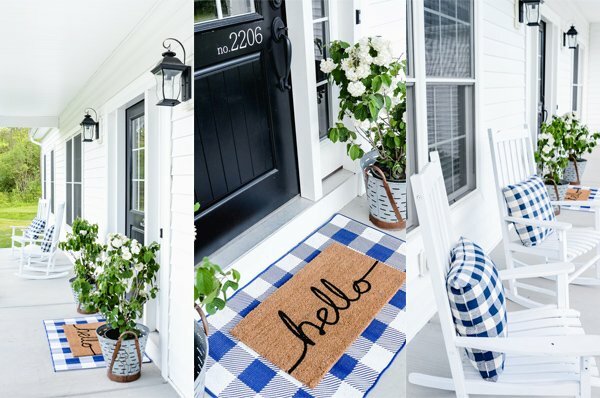 I love this idea – I purchased a ball of twine at the dollar store and I'm obsessed with it now.